Leon Neal / AFP / Getty ImagesShoppers pass a branch of the newly-branded Santander bank on Oxford Street, in central London. 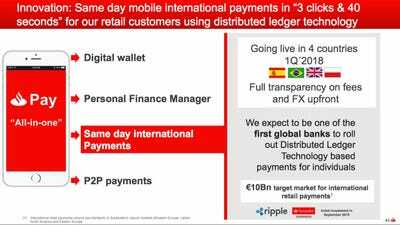 LONDON – Santander is on track to launch an international money transfer app in partnership with fintech startup Ripple in the next few months, the bank’s UK CEO has confirmed. A spokesperson for Santander declined to comment when Business Insider inquired about Bostock’s comments. Santander CEO Ana Botin flagged the upcoming launch to customers of the payment app in the group’s 2017 results presentation at the end of January, saying the new app would go live in Spain, Brazil, the UK, and Poland. 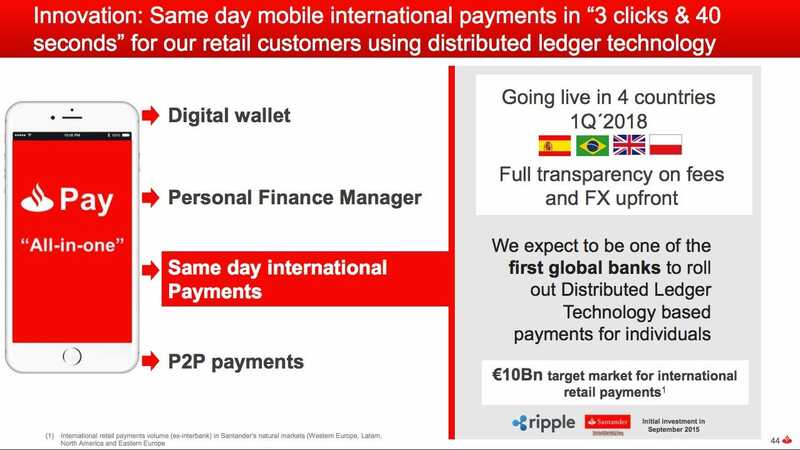 Santander said when it launched its internal app trial that Ripple’s technology allows transfers to be settled within 24 hours, compared to days with traditional cross-border payment providers. The tech also lets people find out up front how much a transfer will cost. Most international transfer systems use various middle men to transfer money who will take cuts along the way so the final sum is often less than when it was sent. Because of the covulted process, most processors can’t give an accurate estimate of the total cost.